The system of choice for long distance ocean racers and world cruisers! Available for boats 19 to 82 ft LOA. For over 25 years Profurl's Units have been extensively used on every ocean throughout the world from Iceland to Cape Horn. 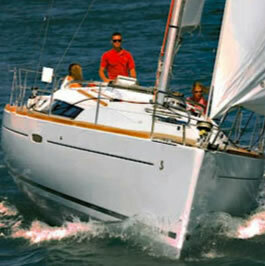 Profurl are time proven and bullet proof reefing systems. All Units have twin groove foil (except C-290)and patented Wrapstop system to prevent halyard wrap. Drum may be mounted high for anchor clearance and/or visibility or low for performance with the optional "I" version turnbuckle cylinder and shortlink plates. Optional low drum mount with internal turnbuckle cylinder for performance sailing. Helps close the gap between the sail and the deck. All Units come with the Unique Wrapstop Feature that helps prevent halyard wrap. R250 Race 19-30' 40' 1/4" 3/8"
R350 Race 31-41' 52' 5/16" 1/2"
R420 Race 37-47' 60' 3/8" 5/8"
R430 Race 42-54' 60' Rod 30 5/8"
model to view a complete brochure. 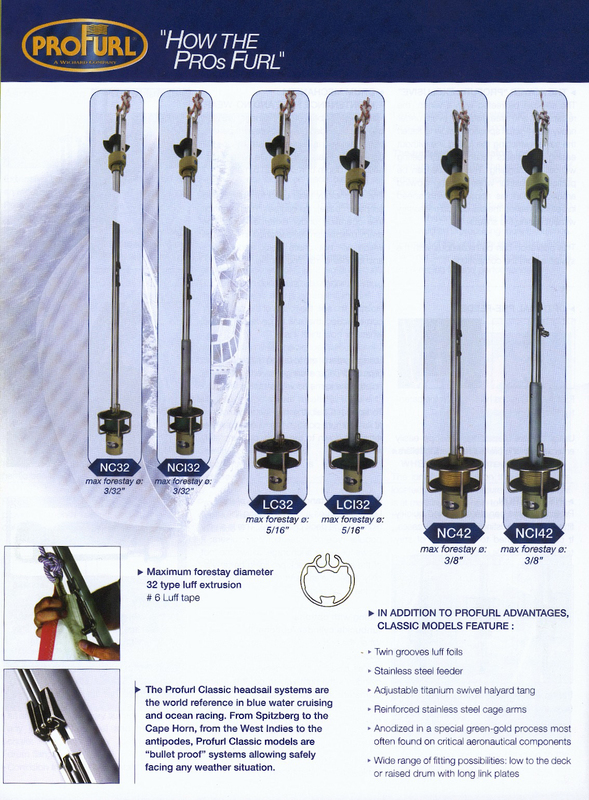 * A special clevis pin is provided with each unit. Please select the correct size clevis pin (to the right) when ordering. * Extra foil kit is required if your heastay exceeds the Std. Pkg. Headstay length. 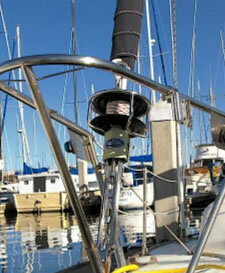 Each furler installation is somewhat unique to the specific boat. Therefore there is no universally standard hardware combination the will work in all cases. Our Furling Unit Pricing only applies to the unit as normally supplied in it's basic configuration. We will try to help you anticipate anything extra that you may need but ulimately it is up to the installer to accurately select what hardware is needed. Any additional hardware that you require must be purchased at your own expense. Hardware substitutions or exchanges are subject to price differences and shipping costs. This simple kit includes one clamp mounted pulpit ball bearing fairlead, intermediate stantion fairleads with stainless steel inserts, one deck mounted fairlead and a deck cleat. Kit includes the furling line and all necessary screws and hardware. This kit uses high quality components and is compatible with most boats using Profurl Units and saves money over buying the individual components.